My patience has been rewarded this morning. I awoke to find that the glue has completely dried and the ballast is set in place with almost nothing coming loose. 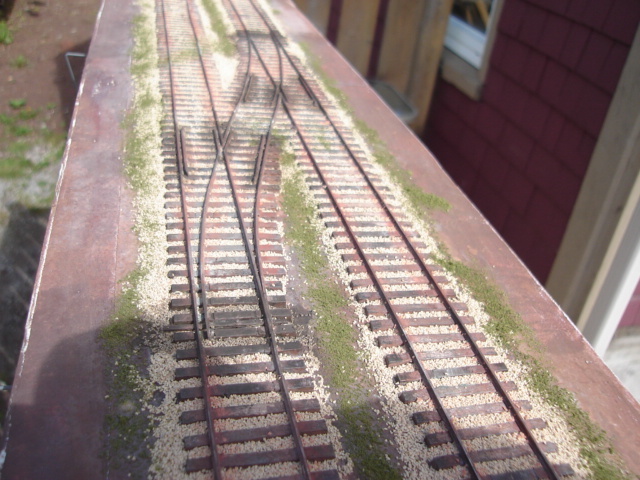 I thought I’d do a little subtle dry-brushing to start weathering the track. 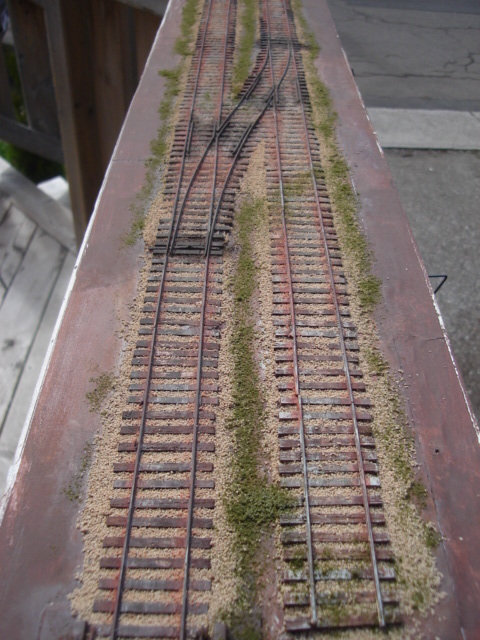 Until I settle on the final setting for this layout I won’t go much further into weathering the track. It’s a beautiful day outside so I thought I’d take layout out and set in on the porch railing and get a few more photos of it after my light weathering. 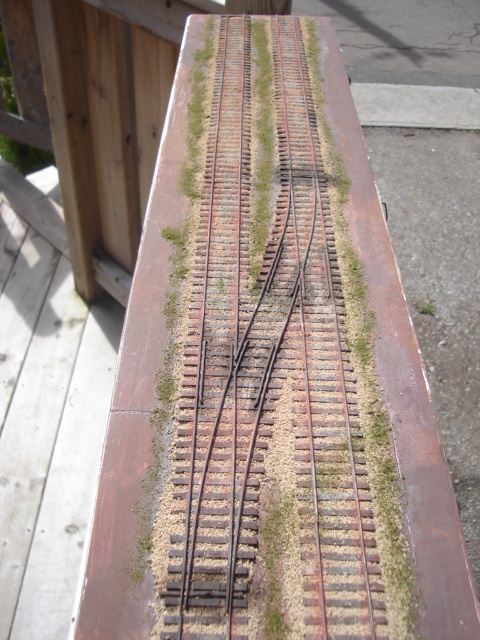 I tried dry brushing along the rail sides and where the rails met the ties with a rust colour. I’m not entirely sold on the final effect and may go over these areas with a more oily-brown colour later on to take away the reddish tones. 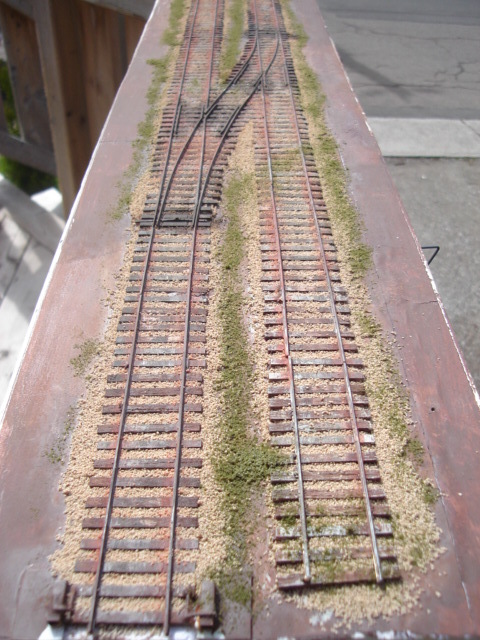 Now to polish those rails and run some trains. ← Tonight we ballast like never before and photos too! I like the weathering, and it should be easy to change if you like a different shade. It really adds to the dimensionality and realism of the track structure! I like the oil “weed control” around the frog and points. It feels like a detail I’ve often seen around prototype turnouts. I assume it’s just waste oil sprayed around these areas as weed control much like the old oil surfaced dirt roads. I wonder how old this practice is? If I was to backdate this all for the early twentieth century would it still be appropriate? As for the rust I may brush some brown toned over it to take away some of the redness.